Wild or red clover is a perennial plant; its short rootstock produces several reddish stems, 1-2 feet high, with close-pressed whitish hairs. The palmate leaves, some basal and come along the stems, have 3 oval to oblong-oval or obovate leaflets which are minutely toothed and sometimes blotched with white. The rose-purple or magenta (to nearly white in some varieties) flowers grow in a dense, ovoid head subtended by a leaf. May to September. Common in meadows, fields, on lawn edges, and roadsides all over North America and Europe. Biotin, choline, copper, coumarins, glycosides, inositol, magnesium, manganese, selenium, vitamins A, B1, B2, B3, B5, B6, B12, C, and P, and zinc. Clover, one of the first plants cultivated by man, has been highly regarded since ancient times. The three-leaf clover was associated with the Christian Trinity, and in pre-Christian eras with the triad goddesses of the Celts. The Middle Ages considered clover a charm against witches. Wood sorrel (Oxalis acetosella) is considered by some authorities to be the true shamrock planted by St. Patrick in Ireland, instead of clover. The rare four-leaf clover, also a Christian symbol representing the cross, was said to enable its wearer to ward off evil and witches, to see fairies and various spirits, to heal illnesses, to have good fortune, and to escape military service. One leaf stood for fame; the second, wealth; the third for a faithful lover; the fourth for good health. The five-leaf clover was said to be unlucky and the two-leaf clover was to enable a maid to see her future lover. The flower heads should be eaten raw (about a dozen daily), or dried and made into an infusion. Infusion: steep 2 tsp. flowering tops in 1/2 cup water for 10 minutes. Take 1 to 1 1/2 cups a day, with or without honey, a mouthful at a time. Tincture: a dose is from 5-30 drops, taken in water. Vitamins A, B1, B2, B3, B5, B6, B12, C, and P, and zinc. Capsules: take one, 2 or 3 times a day. Fall or late-cut hay in large quantities can cause frothing, diarrhea, dermatitis, and decreased milk production in cattle. Diseased clover, externally showing no symptoms, may contain the indolizidine alkaloid slaframine, which is much more poisonous than castanospermine, now being studied for anti-AIDS and antidiabetic activity. PubMed.gov: Non-hormonal therapy of post-menopausal vasomotor symptoms: a structured evidence-based review. PubMed.gov: Safety and efficacy of black cohosh and red clover for the management of vasomotor symptoms: a randomized controlled trial. 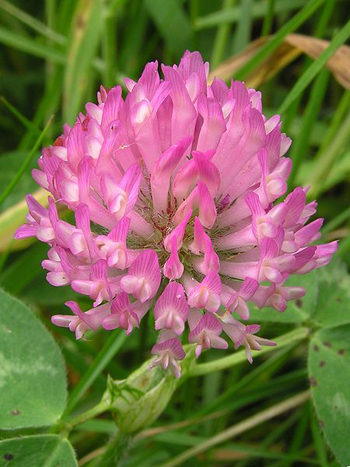 PubMed.gov: Improvement of postmenopausal depressive and anxiety symptoms after treatment with isoflavones derived from red clover extracts.